Playing notes in a two-octave range on the bass guitar can be challenging. The trick is knowing how to find any note in any octave on the neck. One popular method for finding bass guitar notes is called the handspan-plus-two-frets method. With the exception of the five lowest notes, all the notes on a bass guitar occur in at least two places on the neck. Knowing where the alternative notes are located allows you to play two-octave scales and two-octave arpeggios easily and efficiently anywhere on the fingerboard. 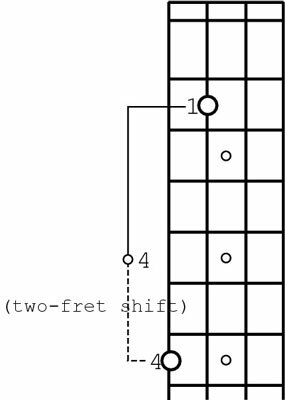 The handspan-plus-two-frets method helps you locate a note on the adjacent string. Start by pressing down a note on the A string with your left-hand index finger, and strike it with your right hand. Now shift your left hand two frets toward the bridge and move your pinkie from the A string to the E string. Press your pinkie down on the E string in that position and play that note. You now have the same note in the same octave as your original note on the A string. You can also use this method when going from the D string to the A string, and from the G string to the D string. This process also works in reverse. The relationship of the notes in the handspan-plus-two-frets method. This method usually works because a normal-sized hand is about as wide as three frets. If you shift your index finger up two frets, that puts your pinkie finger another three frets above that, creating a shift of five frets. And, as you know from tuning your bass guitar, each string is five half-steps, or a perfect fourth, above the next lowest note.